The Samsung Galaxy S5 is the electronics giant’s latest and greatest smartphone, and has brought with it a myriad of exciting new features. As well as the fingerprint sensor, gold color configuration, heartbeat monitor and other such niceties, the device is also a great deal more rugged than its predecessor. 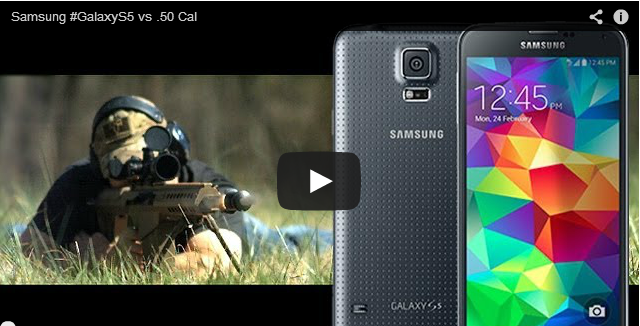 Thanks to a more robust build quality that also renders the handset waterproof, the Galaxy S5 is a lot more rough-and-ready than its predecessor, although as you might imagine, it more than met its match when faced with the bullet of a .50 caliber sniper rifle. Anyway, if you came here to see a Galaxy S5 get absolutely obliterated by a sniper rifle, then I won’t keep you any longer. Check out the gruesome video as embedded below, which also runs through some of the more basic torture tests in advance of the main event, and be sure to leave your thoughts and comments via the comments section.